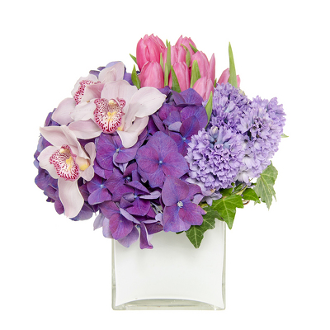 This amazing mix of pinks, purples and whites is the perfect selection to make anyone smile with sweet delight. Same day delivery Los Angeles and surrounding cities. When ordering you can choose to upgrade your arrangement. $115.00 approx overall dim 8"X8"
$160.00 approx overall dim 10"X10"
$215.00 (AS SHOWN IN PHOTO) approx overall dim 12"x12"